Grand Sable Lake and Dunes — This is a part of the Pictured Rocks National Lakeshore, a region of outstanding beauty between Grand Marais and Munising, Michigan. Although there is no date on the postcard, the fact that it mentions the National Lakeshore places it after 1966, when the lakeshore was formed by federal legislation. Also, the existence of the swimming raft and buoyed swim area dates the picture to the late 1960s or early 1970s. Lastly, note that this picture was taken well before the new road was constructed in the 1990s, which changed the shoreline of the lake and eliminated most of the swimming area. Lake Superior Agates from Northern Michigan. A beauty often hidden by a rough outer surface reveals vivid colors and strong translucent designs when cut and polished. 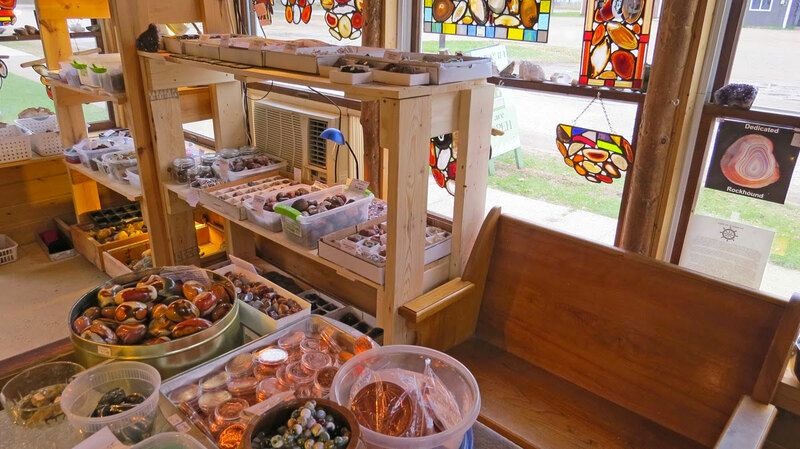 I am not sure where and when this photo was taken, but there are some nice agates among the assortment!